Une sculpture représentant une pomme réalisée par collage de l’artiste tchèque Jiří Kolář et datant de 1972, a été soumise à un traitement de conservation-restauration. La sculpture présentait des dommages structurels causés par des facteurs externes ainsi que des surfaces encrassées. Les interrogations déontologiques soulevées lors de la restauration d’une œuvre d’art contemporain ont représenté un aspect important de l’étude. Par conséquent, la majeure partie des recherches a été dévolue à la compréhension du matériau et de la structure, celle des intentions de l’artiste,tout comme du concept et de la signification de l’œuvre. Ce travail a été étayé par une recherche scientifique ayant pour but d’évaluer l’efficacité du Triammonium citrate comme agent de nettoyage à base aqueuse, ainsi que par une analyse de la construction en trois dimensions de l’œuvre d’art. 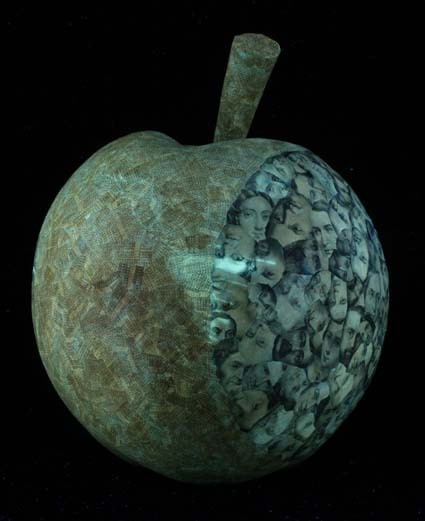 A collaged sculpture of an apple by the Czech artist Jiří Kolář, dated 1972 was presented for conservation. The sculpture suffered from structural damage caused by external factors and ingrained surface dirt. The ethical implications raised in conserving a contemporary artwork were an important aspect and subsequently an understanding of the materials and structure, the artist’s intentions, concept and meaning of the artwork formed a large part of the research. Combined with this was scientific research into the effectiveness of Tri-ammonium Citrate as an aqueous surface cleaning agent and analysing construction of 3-Dimensional artworks. 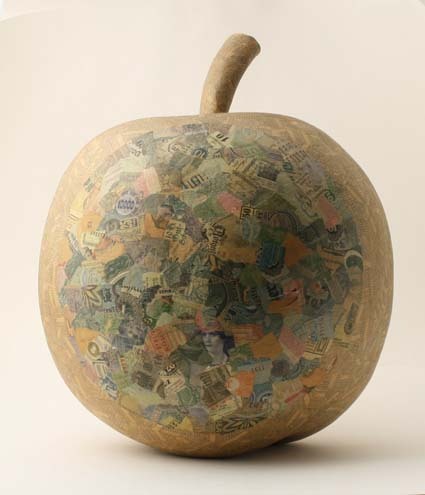 1The sculpture presented for conservation; a collaged apple measuring 36cms tall with a circumference of 91.5cms at its widest point, was attributed to Jiří Kolář, a Czech artist, born 1914 - 2002. Kolář’s initials and a date of 1972 were found after initial examination, handwritten in what looked like a brown porous tip pen. 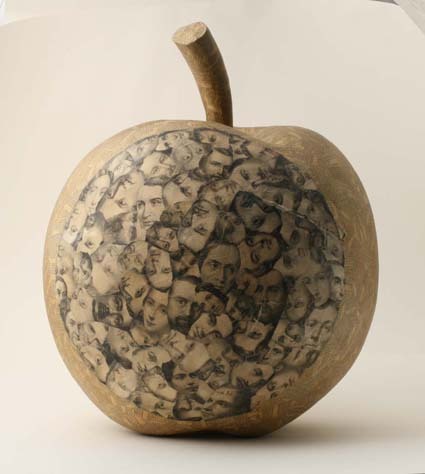 The majority of ‘Apple’1 was collaged with timetable fragments, with two circles either side of the apple, one formed out of portraits of black and white prints2 and the other with coloured ephemera and banknotes. The construction, determined through various forms of analysis, was found to be a polystyrene inner core held in position with nails, over which, a layer of papier-mâché with a subsequent layer of plaster of Paris was applied. 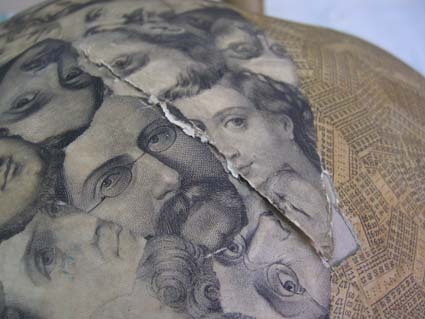 The collage fragments, directly adhered to this layer were covered with an additional application of a coating or varnish. 3 Unpublished, Correspondence with Pavel Zoubok, researcher of Kolář. 2Documentation on the life of the artwork was scarce however research into Kolář’s canon of art uncovered multiple apple sculptures of varying sizes. The apple refers to a tradition in Kolář’s family of planting a fruit tree to mark the birth of a child. When Kolář was born, an apple tree was planted. It is not known if this was a Czech tradition or specific to the artist’s own family, but the sculpture could be regarded as a kind of self-portrait3. Kolář was predominantly known as a collage artist but was originally a poet. According to Kotik, (Kotik 1978) Kolář’s primary interest was in ‘the fusion of the word behind the image or the image behind the word’. His literary background then explains this fusion and makes apparent that language, the written word or the destruction of it played an important role in his artwork. During his lifetime the Czech Republic, as it is now known, had a turbulent history which affected his life and ultimately his artwork. Taylor, (Taylor 2004) believes that ‘the origins of Kolář’s collage lie in the struggles of a censored poet to be heard.’ Tellingly Kolář states that ‘The world attacks us directly’ [and] ‘tears us apart through the experience of the most incredible events, and assembles and reassembles us again. Collage is the most appropriate medium to illustrate this reality’ (Taylor 2004) and Kolář invented many collage techniques including rollages, crumplages and chiasmages. ‘Apple’ is a chiasmage which refers to a collage consisting of irregularly torn fragments from various printed materials glued down onto a surface to create a unified appearance. Kolář progressed from flat chiasmages to low reliefs and in the late 1960s he began to create 3-dimensional chiasmage objects (Kolar 1978). 3‘Apple’ was in moderate condition with the main concerns focussed on structural damage, surface dirt and discolouration. The main site of structural damage was located on the portrait side with a large split measuring 11cms in length and running diagonally through the black and white portrait prints. This impact fracture appeared to have gone through all layers of the sculpture and the top section had been forced behind and below the lower section thereby obscuring some of the collage. To the right of this split ran another which vertically followed the curve of the portrait circle, measures 2.7cms and affecting all layers. A large area of loss was located at the end of the split on the right hand side which went down to the papier-mâché layer. There was also a partially detached fragment at the base of the area of loss consisting of the collage and plaster of Paris layer. Cleavage of part of the collaged plaster of Paris layer as highlighted in red had occurred. The collaged plaster of Paris layer had separated from the underlying structure of the sculpture and was similar to tenting4 in nature. In this case, the slight tenting had been caused by compression of the underlying layers due to impact pressure resulting in a compromised structure. Any pressure exerted on this area would result in further damage to the collage as the separated plaster of Paris layer may have shattered with impact5. 4A cross shaped convex crack was apparent below and to the left of the main impact fracture forming a ridge with a sharp depression on either side with noticeable areas of loss and abrasion to the collaged area. At various other points on the sculpture there was evidence of small areas of mechanical damage, abrasion and stress fractures which mainly affected the collaged layer. 5This damage appeared to be caused by external factors and discussions with the owner confirmed that the damage had occurred due to inadequate packing in transit when the object was purchased. 7Discolouration was noted across the collage layer and was even in tone. Discolouration often indicates acidity in the paper. Fibre analysis of the timetable collage revealed chemical wood pulp; the possibility of ligneous material within the support may have been the cause of the discolouration (Burgess 1982). The use of Alum rosin size which was in use until the mid to late 1980’s (Thurn 2003) could have also been a cause of acid degradation. Furthermore, chemically prepared wood pulp has chain lengths of 1000-2000 whereas cotton has somewhere in the region of 10,000 (Schwerdt 1989). Auto-oxidation of the cellulose chain can form free radicals which can instigate further deterioration. The timetable fragments, being made from chemical wood pulp may degrade quicker as there are more sites for the formation of free radicals. It may be supposed that the portraits and ephemera are printed on better quality paper and may explain why they are not as discoloured. However, the overall evenness of the discolouration implied a connection to the coating. Analysis indicated an alkyd resin, whilst this mainly refers to paint; unpigmented alkyd resins were widely used as varnishes (Phillips 1994). The first alkyd resin paint introduced to Britain in 1932 was based on phthalic anhydride, glycerol and linseed oil with glycerol replaced with pentaerythritol by the 1960s (Standeven 2003). The oils used in the production of alkyds range from linseed, soya, tall, tung, coconut, palm, fish and safflower oil (Nylen & Sunderland 1965). The tendency for oils to yellow could have also been the cause of the discolouration. 8The main aims of the technical examination were to investigate the coating and construction of the apple. Examination with UV revealed the coating exhibited a yellow greenish fluorescence which was quite patchy in appearance. The fluorescence noted indicated a natural resin based on the fluorescent characteristics given (Grant 2000). However this was not confirmed with further analysis. It was considered that the fluorescence may be obscured by dirt and grime as indicated by a strong whitish yellow fluorescence noted across the left edge of the portrait circle. This area in reflected light appeared less discoloured. However, this may also suggest that the fluorescence is actually from the paper and that the coating has been removed here previously. However, there is no information on the history of the apple to support this claim. 9The patchy fluorescence was compared to visual examination under reflected light to see if there was a correlation. The stalk area in raking light revealed a more obvious coating layer and hence chosen for closer examination. Using a handheld UV light the pattern of fluorescence and absorption was noted. Areas exhibiting darker absorption corresponded to darker and possibly thicker areas of the coating. Where areas noting fluorescence there appeared to be minimal coating. This may support the theory that the coating was inhibiting fluorescence from the collaged paper. It was therefore thought that the coating could be a synthetic resin which does not tend to fluoresce (Grant 2000). 10Chemical analysis was undertaken on the coating and was subject to FTIR and GC-MS analysis which indicated an alkyd resin. FTIR analysis was difficult due to the thinness of the coating and it was not possible to scrape a sample off. Thus the coated side of the paper was analysed and the underside so that corresponding peaks could be ruled out. The coated side did exhibit some different peaks compared to the underside with sharp peaks at 2920.3 and 2851.2 cm-1 which were thought to indicate an oil. Numerous other peaks also indicated an oil but it was relatively inconclusive. It served to provide direction for further analysis and the coating was analysed with GC-MS. With GC-MS Dimethyl phthalate was recognised at 12.61 minutes, suggesting that the oil had been modified to produce a drying alkyd. Further information gleaned from this analysis was inconclusive but did suggest an alkyd resin. 11In order to establish the construction of ‘Apple’, globe conservation was reviewed. Although there are many variants to the structure of a globe the general ideology is very similar to ‘Apple’ as indicated by the description of a Senex globe, ‘hollow papier-mâché hemispheres joined along the equator and covered with several layers of white plaster…On the outer surface was pasted down laid-paper gores…’ (Van der Reyden 1988). The most prevalent manufacturing process for creating a hollow sphere described by Knight as ‘Wetted strips of strong paper were placed on a wooden mould, and a shell was built up with successive strips of pasted brown and white paper. After drying, the paper shell was cut through the Equator and removed. The sphere was placed within a frame and revolved as five layers of plaster composed of whiting, glue and oil were applied and then the surface was scraped and polished.’ (Van der Reyden 1988). It was hoped that x-radiography would give an indication as to the method of manufacture. Whilst this technique is sometimes used for the examination of works of art on paper it is not commonplace. This examination technique however, is becoming a useful tool in the examination of modern artworks in an attempt to understand construction and gain further information on the materials used. 7 During treatment it was found that there was an inner core of polystyrene. 12It was not known whether or not the sculpture would image as paper usually transmits x-rays and it was doubtful if any information would be obtained. However, x-ray of globes, which have a similar structure to the apple imaged well. Advice was sought from the National Maritime Museum which aided the settings for the x-rays6. An x-ray, side on, showed surprising results with what appeared to be large nails lying within the structure of the sculpture. The artwork was thought to be hollow and it was not clear where the nails were in relation to the apple – in the middle or around the edge. 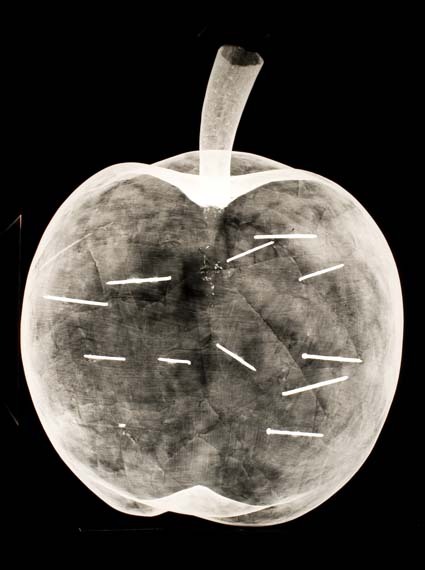 On this basis the apple was x-rayed from above to situate the nails. This showed that the nails radiated out from inside and there appeared to be a square form through which the nails were placed. 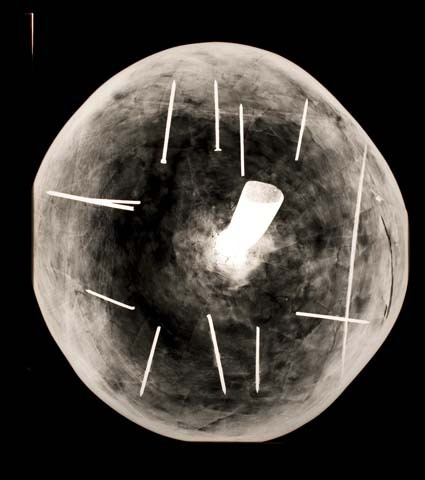 The X-ray did not show a thicker edge or line around the centre which would be expected if the apple were constructed in a similar way to the globes described. This indicated that the papier-mâché layer has been applied continuously round an inner core7 and the sculpture was therefore not hollow. 13As (Pugliese 2008) discusses, ethics in conserving contemporary art need to take into account that contemporary artists use materials in their artworks which are prone to degrade. The artist’s intention may be that the artwork is time-limited and by this very nature the ‘task of restoration can only be slowing down decay, documenting the initial artwork version and its later phases of ageing’. Primarily preventive methods for treatment were therefore considered which followed this principle; however, this negated the main damage. Even though the risks were high the author felt that this area really had to be tackled in order to prevent further damage and to unify the piece. Ethically this was a difficult decision but as the main damage was structural and not due to the artists’ choice in materials it was felt that a more interventive approach could be sought. 14Before any treatment or trials could begin a supporting cushion was constructed which facilitated safe handling and aided access to all areas of the sculpture for conservation treatments. The cushion was made out of unbleached cotton and filled with polystyrene balls. 15The accumulation of loose surface dirt around the stalk and recessed area was removed with a sable brush. Considerations for further dry surface cleaning to remove the ingrained surface dirt included Staedtler Mars Plastic Eraser, ArtGum and chemical sponge. The use of a vacuum was also considered; a vacuum tweezer unit was used in the conservation of papier-mâché masks and proved to be a useful tool for reaching every minute recess (Fairclough & Harrison 2007). However, it was not felt that the shape of the sculpture necessitated the use of the vacuum tweezer unit. For ingrained dirt the most commonly used eraser is the Staedlter Mars Plastic Eraser, a similar type of eraser successfully removed ingrained dirt from anatomical papier-mâché models (Nijhoff Asser 2008). This eraser was versatile and was cut to shape to enable easier access to recessed areas. Some ingrained surface dirt was removed but the results were unsatisfactory in restoring the original sheen. 16Aqueous surface cleaning methods were therefore considered to further remove the ingrained dirt. The main concerns with this approach were the formation of tidelines and the liberation of soluble discolouration, and the possibility of dirt being drawn further in by capillary action (Gavett 1998) & (Perry 1990). Moreover the coating could be adversely affected as alkyd resins have an inferior water resistance and can be easily disrupted by polar solvents and alkaline cleaning reagents (Standeven 2003). A review of water, IMS, saliva and Tri-Ammonium Citrate was carried out and found that water has been used to remove ingrained dirt with varying degrees of success due to its restricted ability to wet the surface due to its polarity and surface tension. (Phenix & Burnstock 1992). However iced water was found to be successful with the conservation of painted papier-mâché models, as it delayed swelling of the binding media during cleaning (Nijhoff Asser 2008). IMS was found to effectively remove residual surface dirt in the conservation of papier-mâché masks, (Fairclough & Harrison 2007) and saliva was found it to be more effective than distilled water (Yallop 2004) and (Hackney 1990). Moreover a study on polychromed sculptures testing the effectiveness of saliva confirmed it as the most effective when tested against a range of other reagents, (Romão 1990). It is thought that this is due to its enzymatic action which works on both lipids and proteins (Gavett 1998). Ingrained surface dirt has been found to be effectively removed with chelating agents, specifically Tri-ammonium citrate8. (Heumans 1992) found it to be effective for the removal of a corrosive crust on a bronze sculpture and there have been several investigations into the action of Tri-ammonium citrate on the dirt removal and the type of dirt removed on varnished paintings, performing favourably without damaging the varnish layer. There was however little research for its use on thinly coated paper and so this became an area for scientific investigation. 17The investigation focussed on the effectiveness of Tri-ammonium citrate as an aqueous surface cleaning agent on surface coated papers, which are seen more frequently in contemporary works of art. There has been little research into its use and effect on thin coatings on paper whereby the chelating agent will penetrate the paper substrate. The investigation studied the effect of Tri-ammonium citrate on the fibre morphology of paper through SEM (Scanning Electron Microscopy) analysis and its effectiveness in the removal of ingrained surface dirt. Paper similar to that of the sculpture had a coating of wheat starch paste applied and artificial dirt which was based on a similar study (Phenix & Burnstock 1992) and consisted of 2g olive oil, 0.25g lead white, 0.4g chalk, 0.16g lamp black and 0.27 yellow ochre. Different methods, concentrations and clearing with water were trialled and it was found that Tri-ammonium citrate demonstrated good removal of dirt although more research is needed in this area into the type of dirt. SEM indicated no adverse effects on fibre morphology and there also appeared to be no differences or residues noted with samples applied with Tri-ammonium citrate to those which were cleared. Continued research into this area could focus on the ageing characteristics of paper cleaned with Tri-ammonium citrate to see if fibre morphology remains unchanged. 18The degree to which the sculpture was cleaned was of importance. As (Perry 1990) suggests, it is difficult to know how far to clean an artwork especially in the case of collages. He cites the work of Kurt Schwitters as an example questioning to what extent the paper and ephemera used in his collages was already soiled and degraded and if this was accepted by the artist as being a part of the object. The use of Tri-ammonium citrate or other chelating agents was felt to take the cleaning a step too far. Furthermore, in the conservation of contemporary collages, it is ‘generally accepted that the various components are likely to change at different rates over time’ (Hendry 2007). After testing at various sites it was found that saliva was the most effective in removing ingrained surface dirt without making the apple look too clean. Saliva moistened cotton swabs were lightly swabbed across the surface of the sculpture and a large amount of ingrained surface dirt was removed successfully restoring the sheen of the coating yet still allowing the object to show its age. 19After a literature review and trials it was decided to tackle the structural damage as the cleavage of the plaster of Paris layer was at high risk of further damage from future knocks or pressure. The main problem with dealing with these structural issues was access. Furthermore, the split was obscuring some of the collage and had compromised the structure. In order to achieve structural stability it was deemed necessary to ‘open up’ the shell of the sculpture and stabilise from the interior. 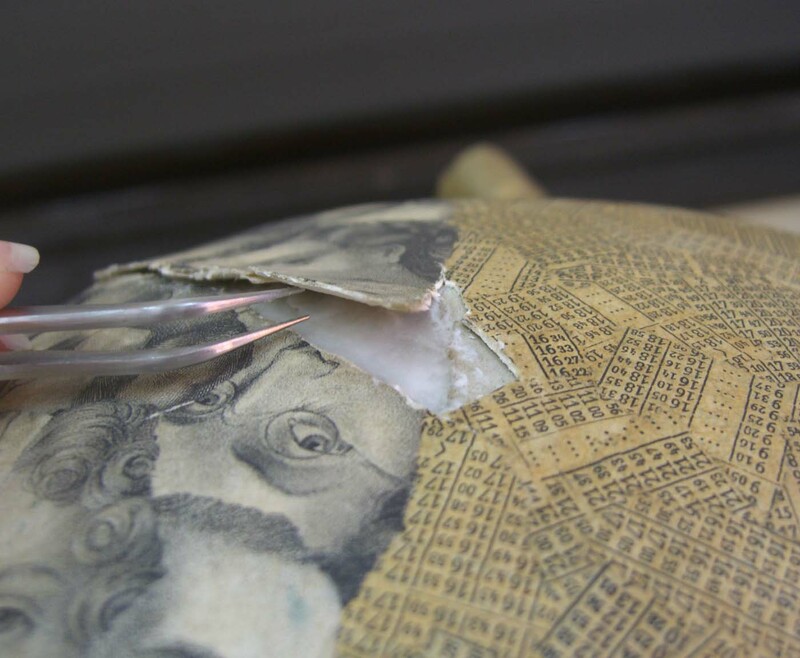 Conservation of globes provided treatment options for structural damage. For easing out a dent in a globe with damage to the paper layer, the paper was split and the dent filled with a plaster compound of papier-mâché, chalk, zinc and parchment size. Alternatively the neighbouring areas could be cut and the dent pushed out. Interestingly moisture applied from within was also a possible treatment, (Van Der Reyden 1988) and it was thought that if this moisture could be applied externally this would negate further damage. Supporting this theory was the use of humidification of distorted papier-mâché masks which were humidified within a Gore-Tex chamber which softened the structure and allowed the papier-mâché to be gently manipulated back into shape, (Fairclough & Harrison 2007). 9 A semi permeable membrane. 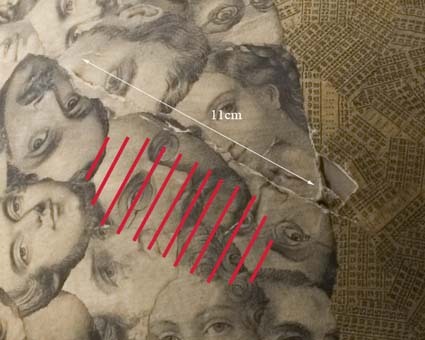 20Localised humidity was therefore trialled on the convex crack located on the portrait side. A layer of SympaTex®9 was positioned with damp blotting paper, thin melinex and then weighted. The area was humidified for a day whilst being checked periodically. The area was evenly humidified and was quite soft and could be manipulated. The ridged area of the convex crack appeared more pronounced but could be easily manipulated back into place. Using a scalpel with a 22 blade the collaged plaster layer was lifted and the ridge of plaster was lightly shaved. The acutely depressed area was pushed at from below but it was felt that an insert underneath this area would give a smoother finish. Three layers of lens tissue were laminated using methylcellulose, 7% in H2­O and positioned and adhered under the affected area with 15% MC. The collaged plaster layer was then repositioned so that the area lay flat. A layer of Bondina10 was positioned over the repaired area and a layer of SympaTex® and dry blotter which was then weighted for controlled drying. The treatment was successful but time consuming taking a total of 3 days. 21Following the successful manipulation of the convex crack the same method was used on the main structural damage. The split was humidified for around 5 hours each day and controlled dried after each session. Initially the raised layer was manipulated before work could begin on the underlying layer as sections of the papier-mâché layer were caught in the layers of the underlying section. 23It was a useful technique but the author had concerns over humidifying for prolonged periods. There was also less time to actually manipulate the area after humidification. 24With the top section freed, the two edges could meet again. Due to the impact the underlying layers were depressed and the area required build up so the collaged plaster layers could be repositioned. 11 A gypsum product that hardens to a plasterlike form when combined with water. 25A suitable material was required to support and stabilise the structural damage. The use of microballoons has been used in a variety of disciplines. (Webb 1998) suggests its use with Paraloid B72 to fill tented lacquer and (Thornton 1993) used it in the repair of papier-mâché architectural mouldings. (Leyshon 1988) re-plastered damaged plaster on a globe with a quick setting hardened dental plaster ‘Kaffir D11’ as a base coat, with several coatings of a plaster mix resembling that originally used which consisted of gelatin, kaolin and chalk. To attach the plaster (Van Der Reyden 1986) describes the process of applying pins as a fence on which to hold a mixture of whiting and plaster of Paris or wood putty. 26More traditional methods are described by (Suntioinen 2000) to repair structural loss in papier-mâché whereby there are attempts to use the original material or manufacturing technique. This includes using either paper pulp or layers of paper. Similar to (Thornton 1993) who used pulp and Methylcellulose pressed into moulds to recreate areas of architectural mouldings. These applications may be useful however due to limited access it would be difficult to create a mould of the area requiring structural repair. 27Similar to the use of pulp is a cellulose paste described by (Nijhoff 2008). Cellulose-fibre paste: pure cellulose fibres, Evacon® R12 was used in the conservation of papier-mâché anatomical models on the edges of flakes. It was also used to reconstruct missing parts and had the advantage that it could be coloured and applied, this was done with 5% w/v Klucel® G in ethanol and mineral pigments. When applying to the flakes the paste could be painted on and built up to the desired level. This method would mean that even with limited access the underlying structure could be stabilised by building up the layers underneath the collage layer so it will sit flush with the surface once more. 29One draw back with this method was the loss of volume when the layer dried. This meant that the technique was time consuming and that the action of humidifying and drying was repeated more often that would have been preferred. 30The same cellulose paste was mixed with acrylics to colour match the body colour and was applied to the losses around the stalk area. This was an area difficult to access and thus the colour matched infill was excellent as it negated the need to tone the infill afterwards. 31The area of loss was also built up with the cellulose paste and an infill was considered. Toning the infill to match the rest of the sculpture was one option but it was felt that a patch of plain colour would stand out against a heavily printed and repeating numerical pattern. The use of photocopies to reproduce the missing pattern has been used with success in a variety of disciplines13 and provides a visual infill. As the timetable fragments have a reproducible pattern and as it was a small area it was felt that this would work successfully and create a unified appearance to the artwork. A photographic reproduction of the timetable area was therefore reproduced and scaled to size. This was photocopied onto cartridge paper which had been previously alkalised and toned with acrylic paint to match. Acrylic paints were used instead of watercolours to reduce the risks of the colour solubilising with aqueous adhesives. The infill was cut to size and chamfered and positioned and adhered with Methylcellulose. 32Methylcellulose was used as a barrier layer for retouching as it is effective and has a proven record in conservation. Artist’s quality watercolours were used to retouch areas of abrasion and damage and in some areas a small amount of graphite was all that was required. Retouching unified the appearance of the object. The important decision was the extent of the retouching which as the function of the artwork was an aesthetic one the ‘readability’ of the piece was important. (Nijhoff Asser 2008) discusses this dilemma in the conservation of papier-mâché anatomical models, whether to keep authenticity or improve the reading of anatomical functions by retouching. It was felt that for the sculpture, retouching areas and toning the infill was the appropriate action and worked well to bring back readability to the artwork. 33To finalise a box was made to be used in the transportation and storage of the sculpture. The sides of the box were made with a lip preventing the lid from being pushed down too far causing damage to the stalk and the cushion fitted into the base designed to support the apple and prevent damage. The author felt that the outcome of the conservation was successful and the sculpture was stabilised and aesthetically improved. The extent of surface cleaning was felt to be appropriate and the natural sheen of the coating was once again apparent. By tackling the split the aesthetic function of the artwork was restored and risks of further damage were negated. Extensive research, mock ups, literature reviews and discussion with peers meant that the difficult and somewhat contentious issue of the interventive approach to open up the split were overcome and with positive results. 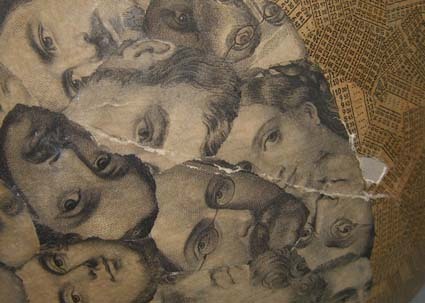 2 The collaged heads or portraits are of varying intaglio techniques including engraving, chalk lithography and woodcut. The generic term ‘print’ is therefore used to incorporate these various printing methods. Jessica Crann graduated from Leeds University with a degree in Fine Arts followed by a traineeship in Archive Conservation at North Yorkshire County Record Office. Gained a Masters degree at Northumbria University in Conservation of Fine Art, Works of Art on Paper and has completed internships at the Art Gallery of New South Wales and Alnwick Castle. 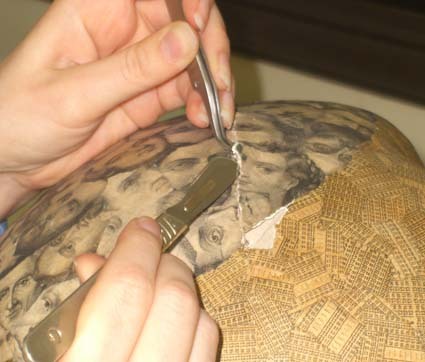 Jessica is currently working as a paper conservator at The National Science Museum.